KJIPUKTUK (Halifax) – Phone calls between prisoners in provincial jails and their loved ones are very expensive. Meanwhile, each phone call by a prisoner increases the profit margin of a Texas-based company, and adds revenue to the Nova Scotia coffers. Synergy Inmate Phones, the Texas-based company that operates the system, charges prisoners $1.85 for a collect local call and $7.50 for a collect 20-minute long distance call. That’s an awful lot of money, especially if your loved ones happen to live outside local call range. The Northeast Nova Scotia Correctional Facility in New Glasgow. 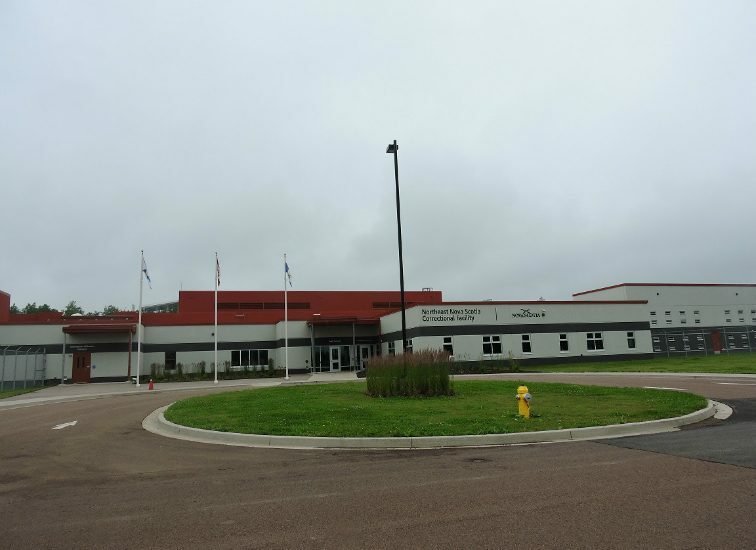 “As Burnside in Halifax does construction on the North unit, hundreds of prisoners are being moved to Pictou – not for disciplinary reasons, conflict, or the requested change – but because of construction beyond their control. They are now 2 hours away from family paying for long distance calls,” wrote El Jones in a recent Facebook post. Even more so if you take into account additional fees and surcharges the company collects for, well, basically everything. Any long distance call will cost you $1.00 if it is prepaid, $1.50 if it’s collect, and that’s before you even touch the dial . Next, the company charges a $2.00 transaction fee and grabs 5% of the deposit if a deposit is made with a credit card. For money orders there is a $3.95 transaction fee. Even if you pay with cash there is a $2.00 surcharge, and you are still on the hook for an additional 2% of the amount deposited. Lots of people in Nova Scotia, people on welfare and even people who earn minimum wage, cannot afford to buy food, let alone absorb the added cost of for phone calls with loved ones in jail. Yet such phone calls are vitally important. “Speaking of isolation, one of the most important things for prisoners and families is phone calls. Maintaining connection to families and communities is important in supporting prisoners through their time inside, and particularly in helping them to have supports when they get out,” wrote El Jones for the Halifax Examiner in January 2016. “For prisoners who are parents, phone calls are obviously vital in being able to be present in their children’s lives. Having supports on the outside are one of the most important factors in reintegrating people when they get out, and in preventing recidivism,” Jones wrote. Synergy Inmate Phones has a Canadian presence in Manitoba, Saskatchewan, Alberta, New Brunswick, PEI and Nova Scotia. As well, the company is a big player in the US prison system. Late last year Synergy began rolling out its system in Manitoba. “I’ve been visiting my fiance in the remand centre for over a year now and the last time I made a deposit on his phone, the prepaid card for offenders, it cost me $13, on top of the $60 I put on it. It’s insane. They’re ripping people off,” a woman told the Winnipeg Free Press in October 2016. And a Saskatchewan couple told the CBC that by the time her husband’s five-month sentence in the Regina Provincial Correctional Centre (RPCC) was up, the couple faced almost $4,000 in phone bills. “It’s the people in the outside world that matter the most and are going to help you … when you get out, because the system doesn’t help you when you get out,” the husband told the CBC reporter. The Synergy system allows for recording and monitoring of calls, phone messaging, and blocking of specific numbers. Its payment infrastructure is also part of the deal. The Synergy system, operational in Nova Scotia since 2013, is run by the company at no cost to the province. “The successful proponent’s revenue will come solely from the user-pay system,” the Request for Proposals (RFP) specifies. On top of that, Synergy is committed to paying the province a commission for the right to make money off the prisoners who use its system, the contract addendum to the RFP stipulates. We also asked if the Department was concerned at all that many inmates and their loved ones cannot afford to have regular phone contact because of costs. That question did not receive a response. In 2018 the existing contract will be up for renewal. The original Request for Proposal allows the province to extend and renegotiate the contract for an additional ten years in total. You can read the entire Synergy fee schedule here. If you can, please support the Nova Scotia Advocate so that it can continue to cover issues such as poverty, racism, exclusion, workers’ rights and the environment in Nova Scotia. A pay wall is not an option, since it would exclude many readers who don’t have any disposable income at all. We rely entirely on one-time donations and a group of twenty or so dedicated monthly sustainers.